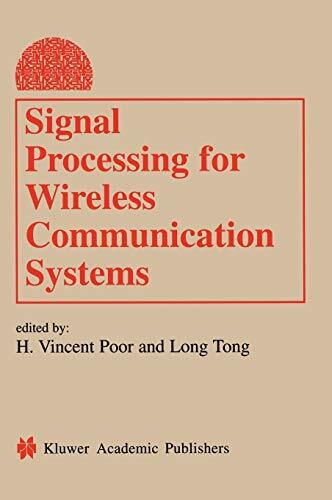 <strong>Signal Processing for Wireless Communication Systems</strong> brings together in one place important contributions and up-to-date research results in this fast moving area. The Contributors to this work were selected from leading researchers and practitioners in this field.<br />The book's 18 chapters are divided into three areas: systems, Networks, and Implementation Issues; Channel Estimation and Equalization; and Multiuser Detection. The Work, originally published as Volume 30, Numbers 1-3 of the Journal of VLSI Signal Processing Systems for Signal, Image, and Video Technology, will be valuable to anyone working or researching in the field of wireless communication systems. It serves as an excellent reference, providing insight into some of the most challenging issues being examined today.